i want to know the torque spec for a single cam oil pan bolt???? Re: torque spec for civic single cam oil pan? i like its like 10ft lbs per bolt right? **** my Haynes manual says- Oil Pan-to-engine bolts-120in-lbs. The bolts must be tightened in at least three passes and in the correct sequence. Well i got mine from a haynes manual. So unless it says 8.7ft-lb in a HONDA manual then i go by the book. My torque number was taken from the Honda Civic service manual. Ok..what ever works i guess. 10 ft-lbs may be fine, not sure. I just wanted to post the number from the service manual and to mention that tightening the bolts in the correct sequence in several passes is critical. 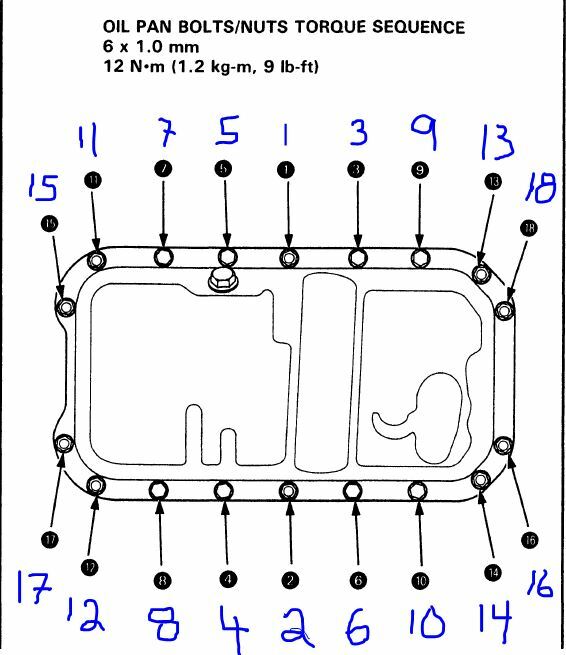 What differs between the D16Y5/D16Y8 vs D16Y7/B16A2 is how much and where you put the gasket maker. 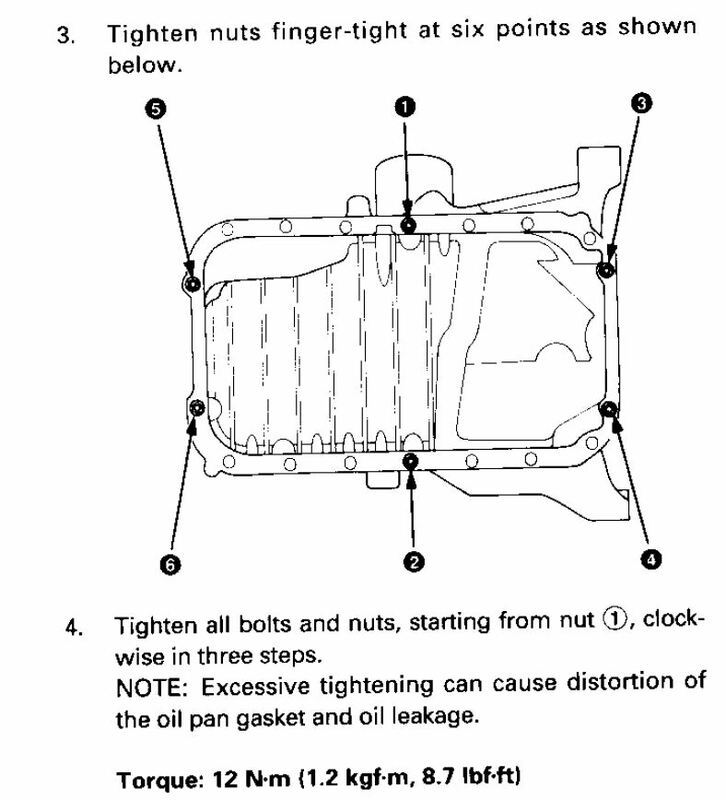 Protip: If the gasket protrudes out from in between the bottom of the oil pan and the block, the pan is on too tight. I torqued mine down to 8.7 and it bent the pan, gasket pooched out, etc. I did this with 2 different pans, then on the 3rd one I tightened up the bolts enough so the gasket was not visible. Haven't had a drop leak since. This is on a D15b7 so I can't comment on any other engine, this is simply my experience. I believe you need a new torque wrench or get yours calibrated, 8.7 ft-lbs is very little torque and would not bend the steel oil pan of the D15B7. I did mine to 10 ft-lbs with an extension and it's been a champ since. (Extensions reduce torque). If you were bending your pan, then it was waaaay higher than 9 ft-lbs. I used a Harbor Freight 1/4" torque wrench with an extension. It's probable that I got one that wasn't good to begin with. I never had a problem with any of their other size torque wrenches but I believe I got a dud if that's the case. You used a precision tool from Harbor Freight. That's your problem. Could also be user error. I'm going to agree with you on this one. That particular torque wrench (and the other ones they sell, why mince words) has various issues. Most of them stemming from the fact that HF tools are, by and large, pieces of ****. I used a Harbor Freight 1/4" torque wrench with an extension. I bough a T-wrench from Autozone a while back and now that summer's here and I want to build my spare block, I'm scared to use it. Just going to get a Snap-on for piece of mind. FWIW, I absolutely love using my step-brother's Snap-On torque wrench. It's a clicker type, and I'm fairly sure that it's touched every nut and bolt on my engine at least once. Even Snap-On's should be calibrated quarterly or monthly in a shop setting depending on business. Home use, probably 6 months to a year is a more typical wrench maintenance schedule. What are d16 oil pan torque specs? H22 oil pan torque spec? Quick Reply: torque spec for civic single cam oil pan?